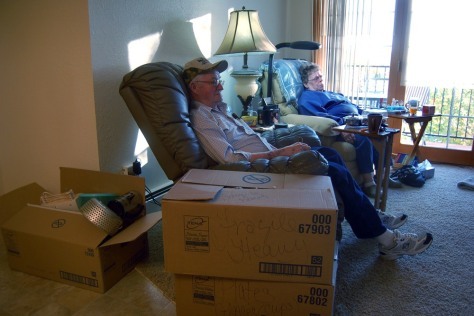 Alton and Mary Lou Sundby take a break during a move into a new apartment in Williston, N.D., on Oct. 27. The Sundby's were notified last month that their rent would nearly triple to $2,000 a month. Thanks to new drilling techniques that make it possible to tap once-unreachable caches of crude, the region that used to have plenty of elbow room is now swarming with armies of workers. But the same booming developments that have made North Dakota virtually immune to the Great Recession has forced many longtime residents to abandon their homes, including seniors who carved towns like Williston out of the unforgiving prairie long before oil money arrived.